Tissue, cells or virus corresponding to Mucin 5AC. Prepared from the fluid of human ovarian mucinous cyst. This product was changed from ascites to tissue culture supernatant on 20th November 2018. Please note that the dilutions may need to be adjusted accordingly. If you have any questions, please do not hesitate to contact our scientific support team. Our Abpromise guarantee covers the use of ab3649 in the following tested applications. Flow Cyt Use 0.5-1µg for 106 cells. Use at 1 - 2 µg for 106 cells for ascites version. IHC-P Use a concentration of 1 - 2 µg/ml. ICC/IF Use a concentration of 1 - 2 µg/ml. Mucins are high molecular weight glycoproteins with 80% carbohydrates and 20% core protein. 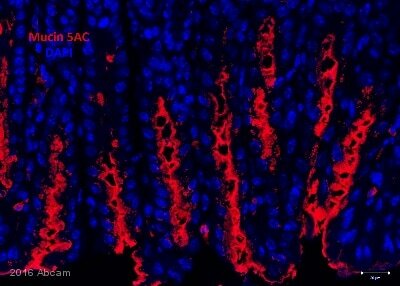 Gastric Mucin 5AC antigen is found in columnar mucus cells of surface gastric epithelium and in goblet cells of the fetal and precancerous colon but not in normal colon. Resurgence of gastric mucin during colonic carcinogenesis is suggestive of either re-expression of the peptide core of gastric mucin in the adult colon or due to changes in the glycosylation pattern of mucin, which expose the hidden Mucin 5AC antigen. ab3649 staining stomach by IHC-P.
Overlay histogram showing A549 cells stained with ab3649 (red line). The cells were fixed with 4% paraformaldehyde (10 min) and incubated in 1x PBS / 10% normal goat serum / 0.3M glycine to block non-specific protein-protein interactions. The cells were then incubated with the antibody (ab3649, 1µg/1x106 cells) for 30 min at 22ºC. The secondary antibody used was DyLight® 488 goat anti-mouse IgG (H+L) (ab96879) at 1/500 dilution for 30 min at 22ºC. Isotype control antibody (black line) was mouse IgG1 [ICIGG1] (ab91353, 2µg/1x106 cells) used under the same conditions. Acquisition of >5,000 events was performed. 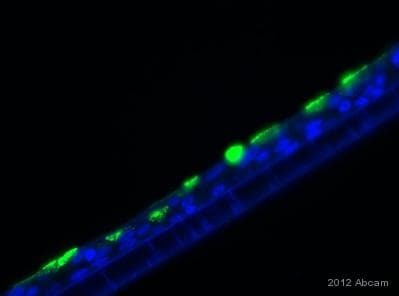 This antibody gave a positive signal in A549 cells fixed with 80% methanol (5 min) used under the same conditions. Immunohistochemical analysis of rat stomach tissue, staining Mucin 5AC with ab3649. Antigen retrieval was performed via heat mediation in a citrate buffer. Samples were blocked before incubating with primary antibody (1/100) for 1 hour at room temperature. An HRP-conjugated anti-mouse IgG was used as the secondary antibody and staining was detected using DAB. 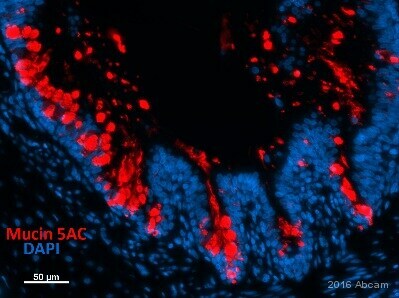 Immunohistochemical analysis of human stomach tissue, staining Mucin 5AC with ab3649. Immunohistochemical analysis of human colon Adenocarcinoma, staining Mucin 5AC with ab3649. Publishing research using ab3649? Please let us know so that we can cite the reference in this datasheet. Could you please let me know what the epitope or the epitope region (amino acids region) for muc5AC antibody 45M1 is? Thanks! Unfortunately, the specific epitope of ab3649 has not been mapped to our knowledge, so we do not know where within the Mucin 5AC protein the antibody binds. As requested we send this form required for the product replacement. Thank you for getting back to me and for providing some experimental details. The protocol looks fine to me. It may well be that the antibody has been damaged during storage or shipment. This antibody has not been tested with Mouse in IHC-P in the Lab but based on these 3 specification, it is suitable for immonohistochemistry on murine samples. 2. Chen G et al. Foxa2 programs Th2 cell-mediated innate immunity in the developing lung. J Immunol 184:6133-41 (2010). IHC-P; Mouse. As our Abpromise indicates, in the event that a product is not functioning in the applications/species cited on the product data sheet (and the problem has been reported within 6 months of purchase) we will happily offer a credit note/refund to the value of the product purchased. Would you be so kind to confirm the Abcam Order Number or the PON? This information is necessary for me to have to proceed with your enquiry. I am sorry to hear that you have been experiencing problems using this product in the application that you wish. In order to assess the quality of our products I would ask that you complete a brief questionnaire relating to the application used. Often it is possible to make suggestions that may help resolve problems experienced using a particular product. All our customer feedback, including complaints are monitored weekly by our in house technical support team. If a product is at fault the technical support team will consider removing the product from our catalogue in order to avoid future customer inconvenience. Could you provide some further details of the protocol used and complete the following form (attached as a word document). It would be much appreciated if you could attach an image to the response. Thank you for your understanding and co-operation in this matter. I look forward to hearing from you soon and resolving this issue as soon as possible. I thank you very much for your support regarding MUC5ac antibody and offer for a free sample but yesterday I have just ordered the antibody from Sapphire (money is not a problem, I hope the ab will work). 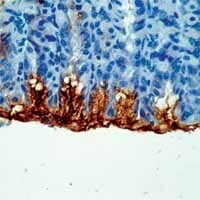 I have some experience with IHC (see below) but if you have any information about the use of this Ab on tissues (fixation, blocking, diluents etc) I will be grateful if you can share it with me (good or bad I will share the data on this Ab with you). I have a question if you do not mind, how is it that monoclonal antibodies produced by the same clone (45MI) that are supposed to react with the same epitope are reacting with different hosts (ab11335 is reacting with Mouse, Rat, Rabbit, Chicken, Cat, Human, Pig, Monkey, Hedgehog while ab3649 is reacting with humans and probably rat)? To clarify, the discount I offered is not a free sample, but can be used to get a free antibody on a future order after submitting an Abreview for ab79082. This antibody was validated using formalin-fixed paraffin embedded tissue, or formaldehyde-fixed frozen tissue. In IHC-P, antigen retrieval was performed using citrate buffer, pH 6 in the microwave. Sections were blocked using BSA or normal serum from the host species of the secondary antibody. The antibody was diluted 1:50 - 1:100 in PBS and incubated for 1 hour at room temperature or overnight at 4C. We would expect ab3649 and ab79082 to give the same results in all applications and speciesbecause they are the same clone. In very rare instances, the conjugated forms will behave differently, which is why we do not automatically add all of the applications and speciesto every datasheet for the same clone. The tested applications and specieslisted on our datasheets reflect what hasbeen tested using that particular format. I hope this helps, please let me know if you need any additional information or assistance. I would like to test ab79082 on canine dog frozen tissues. Is Sapphire your representative in Australia? If so I will place an order soon! Yes, Sapphire Bioscienceis our distributor in Australia. I am very pleased to hear you would like to accept our offer and test ab79082 in canine. This code will give you: 1 freeprimary antibodybefore the expiration date. To redeem this offer, please submit an Abreview forcanine and include this code in the “Additional Comments” section so we know the Abreview is for this promotion. For more information on how to submit an Abreview, please visit the site: https://www.abcam.com/Abreviews. Remember, we publish both positive and negative Abreviews on our datasheets so please submit the results of your tests. The code will be active once the Abreview has been submitted and can be redeemed in one of the following ways: 1) Call to place your order and mention the code to our customer service department; 2) Include the code in your fax order; 3) Place your order on the web and enter the promotional code. The terms and conditions applicable to this offer can be found here: www.abcam.com/collaborationdiscount. 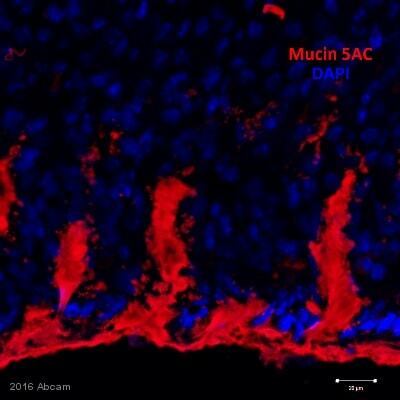 I am looking for an antibody specific for MUC5ac that should react on dog frozen tissues (intestines). It seems you do not have one to fit this but will you please let me know if you have an antibody that might work on immuno- histochemistry canine frozen tissues (do you know the homology between the epitopes recognized by your antibodies and the canine sequence)? Ourantibodies to Mucin 5AC that have been validated for use on frozen tissues are primarily mouse monoclonal antibodies raised against the full length protein, for which the epitopes have not been mapped. Additionally, I have been unable to locate a full length canine Mucin 5AC sequence that I can compare to our immunogen sequences. Unfortunately, I am unable to check the homologies for these reasons. Of the antibodies we currently sell, I would recommend the 45M1 clone: ab3649 or ab79082 (biotinylated). This clone has been shown to react with mouse, rat, rabbit, chicken, cat, human, pig, monkey, and hedgehog. Because of its broad species reactivity, it would likely also react with dog samples. I hope this helps, please let me know if you have any further questions or concerns.